The Farm at Carolina Forest is a popular diversified neighborhood of townhouses, condominiums, and single family homes with prices starting in the affordable low $100’s. The Farm is one of the largest developments in Carolina Forest and is located on Carolina Forest Blvd. just minutes from downtown Myrtle Beach, the Grand Strand beaches, and easy access to Hwy 31. Some of the best South Carolina schools are located nearby, and shopping is conveniently right around the corner with grocery stores, restaurants, and a wide variety of stores and shops. The Farm is a perfect community for families or retirees. The Farm at Carolina Forest features a leisurely lifestyle with a great amenity center that includes an 8,000 community club house, pool, and playground area. The barn-themed clubhouse is perfect for large social gatherings, exercise in the fitness center, or a friendly game of ping pong. Or how about a little full-court basketball? When the near perfect Myrtle Beach weather cooperates, residents can use the walking and bicycle paths for exercise. There is also a smaller pool overlooking a lake. The Farm’s mixed development of homes, condominiums, and townhomes is predominantly single-family houses by quality builder D R Horton. Horton offers several floor plans for new homes, from three to seven bedrooms, and prices ranging from the mid $100’s to over $300,000 for the largest homes with more acreage. Because of the development’s size, there is generally a good selection of home available for sale in The Farm. Homes for sale in the Farm at Carolina Forest offer a variety of floorplans ranging from three to seven bedrooms. Many of these homes have upgrades such as large bonus rooms, Carolina rooms, hardwood floors, granite countertops, and much more. First floor master bedrooms are popular in the neighborhood. Some homes provide great views of lakes or back up to protected wetlands. New homes are still being built in The Farm so if an existing home doesn’t meet a buyer’s needs, a new semi-custom home is still a possibility. The homes within the farm range from 1200 to over 4000 heated square feet. There are over a dozen floor plans to consider, and something for just about anybody searching for a home in the Myrtle Beach area. Many of the Farm at Carolina Forest homes include special features like vaulted and tray ceilings, open concept floor plans, split bedroom floor plans, upgraded kitchen countertops and cabinetry, formal dining rooms, finished bonus rooms, screened porches, and so much more. For gourmet chefs (or wannabes) The Farm at Carolina Forest is a natural gas community. The Orchards and Planters Point are wonderful low-maintenance communities featuring spacious two, three, and four bedroom townhomes and condominiums that are perfect for first time home buyers, investors, or anyone looking for a simple, low-maintenance lifestyle. Many of these condominiums and townhomes include a private garage. Homeowners in either community enjoy all the advantages of living in Carolina Forest and they have access to all the great amenities of The Farm. 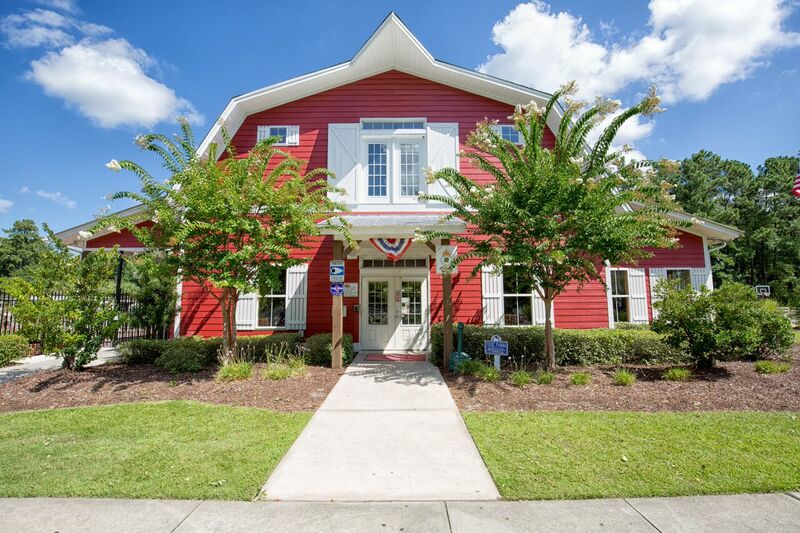 The Orchards is a community of 180 townhomes located within The Farm at Carolina Forest. There are two and three bedroom floorplans available ranging from just under 1000 to over 1700 heated square feet. Many of these townhomes have detached garages. Of course, ownership offers access to all the amenities in The Farm at Carolina Forest. The Orchards at the Farm is a community of two, three, and four bedroom townhomes. There are many different floorplans, many of which feature first floor master bedrooms, large lofts, screened in patios, garages, and more. Many of these townhomes also feature wooded and lake views. The Home Owners Association at The Farm at Carolina Forest has done a great job enforcing the community’s rules and regulations. The community is a great looking, well-maintained, family friendly neighborhood with great amenities while keeping HOA fees to a minimum. Among other coastal South Carolina real estate including all of Carolina Forest, The Trembley Group Real Estate Sales Professionals specialize in homes at The Farm at Carolina Forest. For additional information about the Farm at Carolina Forest homes for sale including, floorplans, a community site plan, covenants and restrictions, or to arrange a tour and a private home showing please contact The Trembley Group Real Estate Sales Professionals at 843-945-1880!